Mickey Mouse is moving to Hawaii! 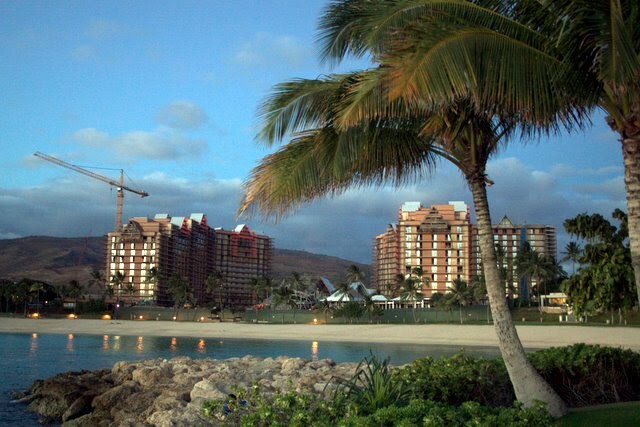 Construction is well underway on Aulani, the new Disney Vacation Club and luxury hotel that is being built in an amazing location directly behind Lagoon 1 at the Ko Olina Resort in Oahu Hawaii. The last time we visited Hawaii back in 2008 this area was just a big plot of grass. It is amazing to see the tremendous amount of progress that has been made on this new Disney Mega Resort that will be set on 21 acres. Aulani will offer 460 Disney Vacation Club Villas (including 21 Grand Villas) and 359 hotel rooms (including 16 suites), 4 restaurants, 2 lounges, 10 recreation facilities, a large spa with 15 treatment rooms, fitness center, conference center, outdoor venues, and a storytelling fire pit. Unfortunately, the current construction noise and activity does not make it the ideal time to have a Ko Olina destination wedding or dream vacation stay at the beautiful JW Marriott Ihilani Resort right now. On the bright side, Lagoon 1 feels empty most days. Construction ambiance may not be the most romantic or relaxing for vacationers, but my 1 year old son loves to watch the BIG machinery transform piles of building supplies into huge high rise buildings. I’m talking at least three big cranes and serious diggers, loaders, and all sorts of crazy trucks and specialized building equipment. It’s quite impressive to see how much progress is made every day. When you’re walking past the building site, it’s surrounded with high plywood walls painted green. Although the plywood walls block the beautiful ocean view, it also contains all the dust and debris that are inevitable with a building project of this magnitude. It creates a surprising and dramatic view of the ocean when you finally walk past the walls and catch a glimpse of Lagoon 1. The new Disney property looks like it will be very fun with unique features like tubing around a lazy river and a huge water slide. I’m sure Disney will also do a big wedding business at this property, as Ko Olina is a very popular spot for destination weddings. Perhaps they will also offer cruise and land packages that include this new resort. Get your favorite Hawaiian shirt and Aloha wear ready, it won’t be long before everyone can share fun in the sun at this truly dreamy, magical new Disney Resort and Spa that is sure to be a big hit with the entire family. Phase 1 is scheduled to open as early as August 29, 2011. Mickey Mouse in a Hawaiian Shirt! Until the construction is complete, here is a link to the newest Disney Vacation Club property and luxury hotel, Aulani.